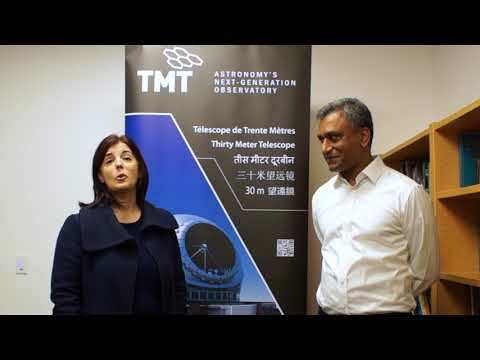 The California Institute of Technology and the University of California have received a $200 million commitment over nine years from the Gordon and Betty Moore Foundation toward the further development and construction of the Thirty Meter Telescope (TMT). Funding under this commitment will be shared equally between the two universities, with matching gifts from the two institutions expected to bring the total to $300 million. When built, TMT will be the largest telescope in the world. The telescope design is being developed by a U.S.-Canadian team that includes the California Institute of Technology, the University of California, and the Association of Canadian Universities for Research in Astronomy (ACURA), with completion of the design-development expected by March 2009. One of the most highly regarded institutions of science and engineering in the world, Caltech is home to some of the best students and faculty who share one mission: to create the innovative, unparalleled science and technology of tomorrow. Caltech is a small, focused institution, providing one of the best student-to-faculty ratios among academic institutions. Caltech enrolls about 2,000 undergraduate and graduate students total. Because of its size, it provides an exceptional opportunity for a comprehensive, inter-disciplinary scientific research experience for its students, and access to a faculty and alumni holding over 32 Nobel Prizes. Caltech also operates outstanding facilities including the Jet Propulsion Laboratory and the Palomar and Keck observatories. The University of California, founded in 1868, is a system of 10 campuses with a mission of teaching, research and public service. With 214,000 undergraduate and graduate students, UC is the world's premier public research university. UC has five medical schools, four law schools and the nation's largest continuing education program. Fifty researchers affiliated with UC have been awarded Nobel Prizes; 18 of theses prestigious awards have been won since 1995. UC also has more than 350 members in the National Academy of Sciences, and UC-affiliated researchers have received 56 Medals of Science since Congress created the award in 1959. UC is involved in the management of three national laboratories on behalf of the Department of Energy - Lawrence Berkeley, Los Alamos and Lawrence Livermore National Laboratories. The Association of Canadian Universities for Research in Astronomy is an organization of Canadian universities dedicated to the advancement of research and teaching in astronomy and astrophysics in Canada. It assists in coordinating large-scale national initiatives of its member institutions, advocates for the priorities in the Long Range Plan for Astronomy, and is a liaison between Canadian member universities and international partners in international and world observatories. The Gordon and Betty Moore Foundation, established in 2000, seeks to advance environmental conservation and cutting-edge scientific research around the world and to improve the quality of life in the San Francisco Bay Area.